The 3 million EU citizens who have made their lives in the UK are understandably concerned about their post-Brexit residency rights, as are the 1 million or so UK citizens who have settled in the EU. While there is a broad political consensus that they should be able to stay and the prospect of legal certainty in the UK’s EU exit agreement, the uncertainty is still deeply unsettling. So just imagine how awful it must be to have lived in the United States for many years and now to suddenly face the threat of deportation “home” to a country that you left decades ago and may barely know. Nearly 200,000 Salvadorans have had the right to live in the US since devastating earthquakes in El Salvador in 2001. 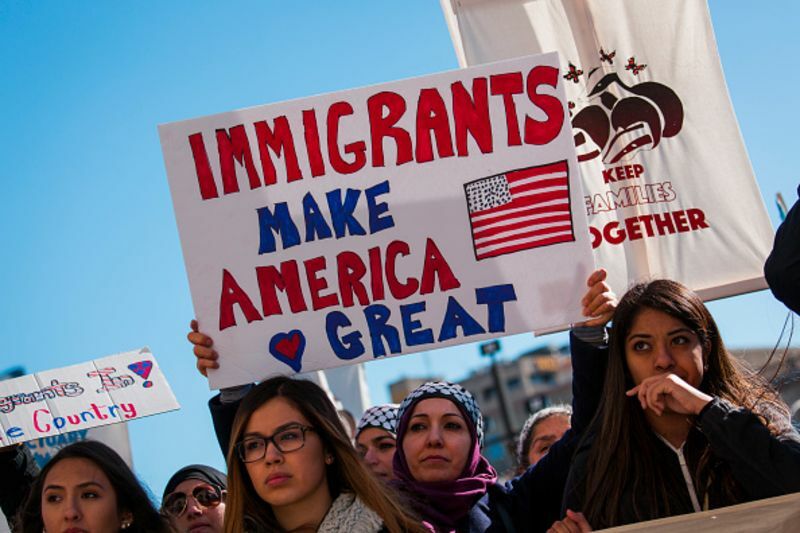 At the beginning of the month, the Trump administration announced that it was ending their “temporary protected status” and they would have to leave within 18 months. It had already given 46,000 Haitians similar notice to leave last year. Vox explains the background and details. The threat of deportation is even more imminent for 800,000 “Dreamers” who were brought to the US illegally as children. They came out of the shadows in 2012 when President Obama granted them the temporary right to live, study and work in America, renewable every 2 years. Applicants were vetted for any criminal history or threat to national security and had to be students or have completed school or military service. Unless the law changes, Dreamers’ legal status will start expiring in March and all will have lost the right to stay in the US by March 2020. This is not just a humanitarian issue; it’s an economic one. The US Chamber of Commerce, the main business lobby group, said terminating Salvadorans’ and Haitians’ status would “end the work authorisation of many key employees for our member companies”. Business leaders have been even more vocal in their support for the Dreamers, many of whom are highly educated. The hope is that US legislators will devise a permanent solution that enables these Americans in all but name to stay. Some 87% of Americans (and 79% of Republicans) support allowing the Dreamers to stay, including a majority of both Republicans and Democrats in Congress. Even Donald Trump professes to be sympathetic to their plight. But the problem, as always, is politics. Trump insists on bundling a legislative pathway to citizenship for the Dreamers with $25 billion in funding for a border wall with Mexico (the one that Trump insisted Mexico would pay for during the presidential campaign) and a huge cut in legal migration. The White House wants to slash family migration, the main entry channel into the US. Ironically, that how’s members of Trump’s own family have migrated to the US; Donald Trump is the grandson of German immigrants. Trump also wants to end the visa lottery programme that randomly awards permanent residence to 50,000 applicants from countries under-represented in US immigration. Congressional Democrats are understandably loath to agree to all that. If you want to do something to support the Dreamers, the biggest Dreamer group is United We Dream. You could also donate to the National Immigration Law Center, which defends immigrants’ rights. Make your voice heard on social networks. And if you’re American, call your representatives in Congress. Here’s some practical advice on how to do so and what to say. One final thought. The status of EU citizens in the UK and UK citizens in the EU isn’t secure until the UK signs an exit deal. With the Conservative Party in civil war over how far the UK ought to diverge from the EU after Brexit, there is still a risk that the UK might crash out without a deal. Make your voice heard by supporting The 3 Million and British in Europe. In a big speech in Calais, President Emmanuel Macron announced big reforms to France’s asylum system. France received a record 100,000 asylum seekers last year. On the plus side, he wants to speed up the processing of asylum claims from 18 months to six, as Germany has done, a move OPEN advocated in our Step Up report with the Tent Foundation. He also wants to speed up refugees’ entry into jobs, notably by improving language and skills training and expanding job opportunities. Those are sound aims, but it still isn’t clear how he wishes to achieve them, and thus how successful the new measures are likely to be. Based on international experience, Step Up provides plenty of advice on how best to do so. The sting in the tail is that Macron wants to speed up the deportations of those with unsuccessful asylum claims. “L’humanité sans l’efficacité, ce sont de belles paroles. L’efficacité sans l’humanité, c’est de l’injustice,” he said. [Being humane but not effective is just nice words. Being effective but not humane is injustice.] While Macron argues that France can’t admit people indiscriminately, aid groups fear mass deportations. The holiday period was a very sad one for OPEN. Two friends, who were also members of our Advisory Board, passed away: Jean-Pierre Lehmann and Peter Sutherland. They were both very supportive of OPEN and of me personally and will be sorely missed. Jean-Pierre was a passionate supporter of openness, for both people and products. Among many other things, he founded the Evian Group, an international coalition of business, government, and opinion leaders with a common vision of enhancing global prosperity for the benefit of all by fostering an open, inclusive and equitable global market economy in a rules-based multilateral framework. Peter was an indefatigable champion of refugees and migrants during his 11 years as special representative for the UN Secretary General on international migration, during which time he founded the Global Forum on Migration and Development. He also made a huge contribution to international trade, having been the last director-general of the GATT when the Uruguay Round was completed and the first DG of the World Trade Organisation. A passionate European, as a European Commissioner he created the Erasmus programme of international student exchanges and helped open up competition in airlines, telecoms and energy. On a positive note, we’re delighted that Kate Hampton, the CEO of the Children’s Investment Fund Foundation, has agreed to join our Advisory Board and look forward to announcing more new members soon.